“In September 2012, the Department of Health authorised the use of stevia in South Africa, giving Huletts the opportunity to respond to global trends in introducing a sweetening solution and meeting consumer demand for natural products. 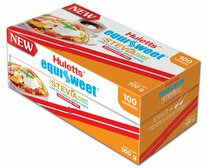 Huletts EquiSweet with Stevia Plant Extract is made from the stevia extract called ‘Reb A’. There are similar extracts known as steviol glucosides found in the stevia plant, but Reb A offers the sweetest and the greatest taste. It is heat stable, retaining its sweetness when exposed to high temperatures which makes it an excellent sugar substitute in teas, coffee, cold beverages, cooking and baking. Reb A is 150-400 times sweeter than sugar, and has a liquorice aftertaste. In late October, specialist sugar-free foods company, Cape Town’s Delite Foods launched Tantalize, a stevia leaf extract liquid sweetener.